NASA’s planetary science program depends on regular missions to solar system bodies to gather data. A combination of budget cuts and previous commitments to develop missions currently in the pipeline means that development of follow on missions may slow to a crawl. In this post I look at the current situation and NASA’s plans and then look at options the agency may consider if budgets remain tight into the next decade. 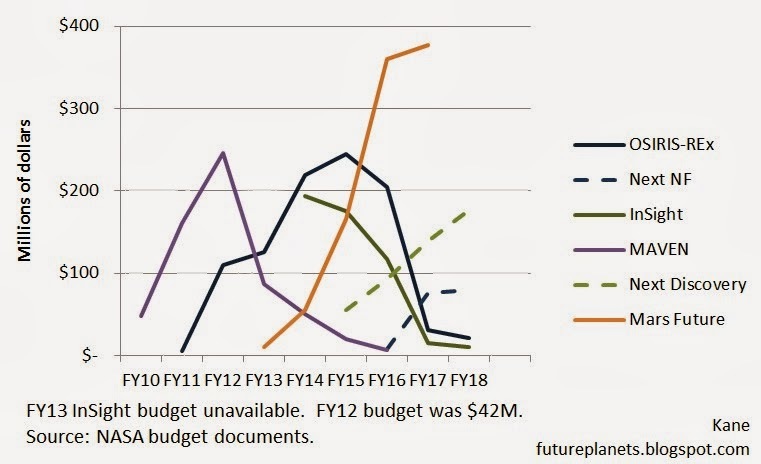 Space News recently carried an article that described how the mission roadmap laid out in the recently completed Decadal Survey was no longer affordable given cuts to NASA’s budgets. A single large mission threatens to crowd out the start of smaller missions that would enable regular flights. Space News quotes a leading scientist in the field who says, “The result is ‘a strategic program that is drawn out in a way that is acceptable to no one’”. The roadmap in question is for NASA’s heliophysics program, which has a budget about half the size of the planetary science program. The large mission is the Flagship Solar Probe Plus spacecraft that will make multiple close passes to the sun and is expect to have a cost of $1.2B to $1.4B. Earlier this decade, NASA completed roadmap plans (called Decadal Surveys) for each of its science programs (except the Earth science program, which completed its Survey in 2007). All the Surveys were told to base their plans on projected budgets that turned out to be wildly optimistic. As a result, the plans included a mixture of large and smaller missions that would ensure frequent flights to explore multiple targets. For the Planetary Science division, the authors of the Decadal Survey recommended for the coming decade development of one to two Flagship missions (in the $1.5B to $2.5B range), two new Frontiers missions (~$1B), and several Discovery missions (~$500M). 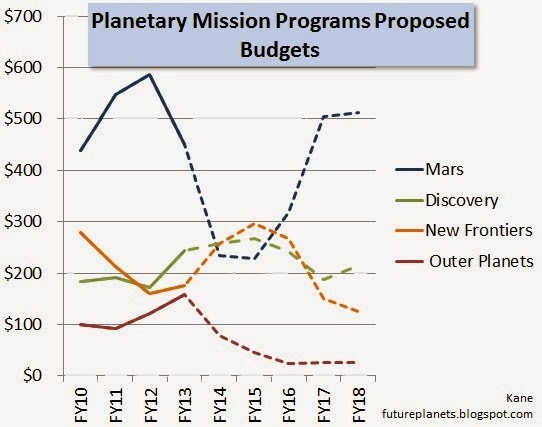 If the Planetary Science Division’s budgets had remained at the levels projected when the Survey was drafted, we would be looking forward to an incredibly rich program of missions to many solar system destinations. Now following the budget cuts, projected budget shows that the Planetary Science Division will struggle to keep missions in development in all three of its size classes. Instead of starting development for six or more new flights to the planets, we will see just three new missions launch through the end of the decade and perhaps only one in the first part of the next decade. Approved missions in development (solid lines) as well as projected funding for future missions (dashed lines). Actual (solid lines) and projected (dashed lines) funding for NASA's major mission categories. For the Planetary Science Division, the squeeze will begin in 2016 when it begins to heavily spend on the development of the $1.5B 2020 Mars rover. To afford this large mission, the budget plans show cuts in budgets elsewhere. In 2015, the budget for outer planet missions that funds the continued operation of the Cassini orbiter at Saturn is projected to substantially shrink. (See my post here on the potential early termination of the Cassini mission.) At the same time, funding to develop future New Frontiers and Discovery missions drops dramatically. The problem NASA faces is compounded by the funding pattern missions in development follow. While missions typically take four to five years to move from approval to launch, most the funding comes in the middle of years of development in what is known as peak funding. To develop missions that will launch in the early part of the 2020s, NASA needs to be able to meet a peak funding level somewhat greater than $200M at the same time as the 2020 rover hits its (much higher) peak funding needs. 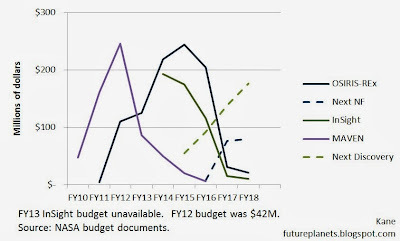 Based on the projected budgets, it appears from NASA’s budget documents that there just won’t be enough money to sustain mission in development in all three of its mission classes at the end of the decade. However, if NASA were to combine projected funding for its New Frontiers and Discovery programs at the end of the decade, it appears that it could support development of one mission along with the 2020 rover. Based on statements from the Planetary Science Division’s chief, Jim Green, at the just completed American Geophysical Union conference, that appears to be what NASA plans to do. NASA will request proposals for the next (fourth in the series) New Frontiers mission around 2015. NASA would then likely select the winning proposal in late 2016 or 2017. Given approximately five years for development, the new mission likely would launch in 2021 or 2022. In case the budget situation improves, NASA plans to also complete the preparatory work to request proposals for a Discovery program in the same time frame. However, the plan for developing a New Frontiers mission at the end of the decade depends on the 2020 rover being developed at a cost near $1.5B. That mission currently is in the early formulation stage and a final budget hasn’t been set. If the rover costs come in substantially higher, then affording simultaneous development of a New Frontiers mission could be difficult at best and or impossible. It takes so long to plan and develop planetary missions that NASA has limited options for restructuring its program of missions to deal with tightening budgets through the end of this decade. But if fewer dollars to develop missions is the long term story, what other options could NASA explore? Everyone agrees that having NASA’s planetary science program consumed by a single large mission creates too much risk (what if the mission is lost at launch?). Because a single mission will necessarily explore just a single destination with a small suite of instruments, most of the scientists in the field will be starved for new data. (The 2020 rover, for example, will not explore what drives global climate patterns, explore whether Venus was once habitable, or explore how the planets formed.) NASA also needs to have a cadre of scientists and engineers who have participated in developing missions to become the leaders of future missions. That’s difficult to do with a single mission in development. One idea that has been discussed within NASA has been to reduce the number of Flagship missions to enable funding more small missions. There’s also been a history of Flagship missions regularly experiencing severe cost overruns, starving the rest of the science program. NASA’s administrator, Charles Bolden, recently told a science advisory panel that NASA can’t afford Flagship missions any more. NASA later explained that NASA was not abandoning Flagship mission and understands that some key science questions can only be tackled with these large missions. My take is that NASA wants to limit its exposure to Flagship missions for the reasons given above. At the same advisory panel meeting, the Associate Administrator for Science, John Grunsfeld, said he wanted to begin studies that would look at whether substantial portions of high priority Flagship missions could be done as New Frontiers missions (perhaps with a bump of 25% or 50% in the cost cap). Could a New Frontiers mission be done for Europa? The Decadal Survey analysis concluded that a multi-flyby mission for Jupiter’s moon Io could be flown as a New Frontiers mission. An Io mission would have to deal with the same key issues a Europa mission would face – requirements to host both remote sensing and in-situ instruments, the high radiation fields of the inner Jovian system, generating power far from the sun, and communicating large amounts of data back to Earth. The Io Observer study results suggest that a New Frontiers mission for Europa is a credible concept to study. However, compared to the proposed ~$2B Europa Clipper multi-flyby Flagship mission, many key questions about Europa couldn’t be addressed by a single New Frontiers mission. Another possibility for NASA would be to include even cheaper missions than Discovery missions in its program mix. A committee of scientists reviewing options for the heliophysics program recommended that NASA develop technology to enable scientific missions with very small spacecraft, SmallSats and CubeSats. I have previously written about the potential and limitations for these small missions that could cost just a few $10Ms for SmallSats and $1Ms for CubeSats. Because of the small size of these spacecraft, the science they could do would be limited. However, several could be flown in a decade increasing the variety of science conducted. Perhaps more importantly, these missions could be used to train a new generation of scientists and engineers to become leaders on larger missions. Through the end of the decade, NASA’s planetary managers have limited options. They can’t, for example, just dictate a Europa New Frontiers mission without first doing an intense analysis of the concept. They can’t simply decide to introduce SmallSat missions before they know the designs are feasible, the technology is ready, and that there would be scientific value for the money spent. For mission development in the next decade, NASA has time to fully evaluate these options. If NASA has a similar budget for new mission development in the 2020s as it is projected to have the rest of the decade, then it would have an inflation-adjusted $5B to $6B over the decade. With that funding, it could, for example, fly two to three New Frontiers or New Frontiers-plus missions and approximately four Discovery missions and perhaps several SmallSat missions. It would not be as rich a program as we had in the plusher years of 2000 to 2012. It could be a richer program than we seem likely to develop this decade. Also, budgets are not fixed. While we have seen that they can go down, they can also go up. Even modest increases of $100M per year over the current projections of ~$1.2B per year would go a long way towards enabling a richer program this decade. If you haven’t participated in the Planetary Society’s campaign to lobby for increased funding, I encourage you do so. 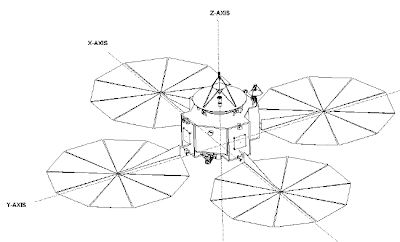 One of the tasks for the Decadal Survey was to develop a list of missions that scientists could propose for competitions to select New Frontiers missions. The Survey approved five missions for the next selection (New Frontiers 4) and approved an additional two for the selection after that (New Frontiers 5). The latter are indicated with an asterisk. NASA may consider expanding this list to partially fulfill the goals the Survey identified for recommended Flagship missions such as a mission to Europa (see above). I wrote a post on possible low cost missions to Enceladus and Titan a few weeks ago. Then NASA announced that it was cancelling the ASRG power systems that the two mission concepts described depended upon. There no longer seemed a reason to give an update on missions designed to explore the active plumes of the icy moon Enceladus at Saturn. Today, of course, we have the news that plumes have been observed at another icy moon, Jupiter’s Europa. All of a sudden, missions for to explore moons with icy plumes are very relevant. 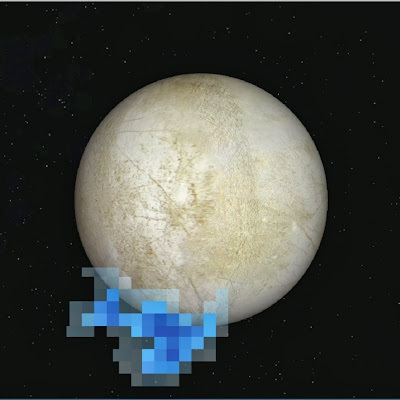 If follow up observations show the plumes of Europa to be persistent, then I would be shocked if no one proposed a Discovery-class ($425-500M) to explore those plumes up close. To play armchair mission architect (and remember that I am a rank amateur), one could imagine a small spacecraft with cameras or a UV spectrometer to observe and characterize the plumes from afar (say from the relatively low radiation environment near Ganymede’s orbit). Then the spacecraft might dip down one or more times to Europa’s orbit to fly through the plumes and sample its composition with a mass spectrometer. 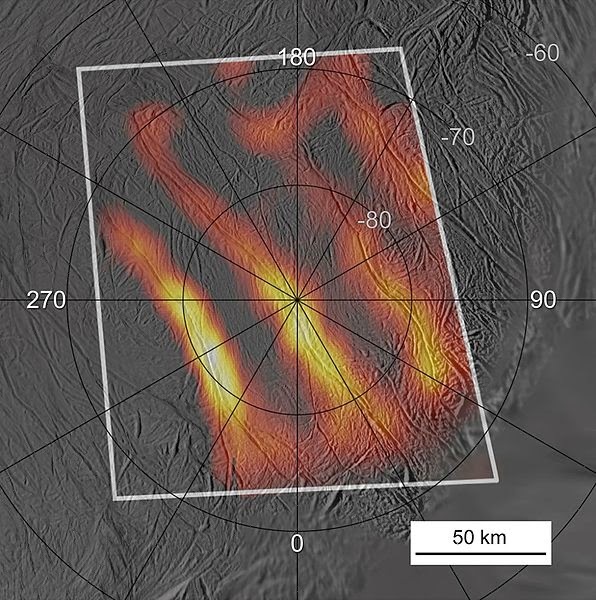 During the flybys, a thermal imager or a mapping near infrared spectrometer might study the surface surrounding the sources of the vents as well as map other regions of Europa. (However, the $2.1B proposed Europa Clipper with its many instruments and radiation hardening for many flybys would be far better if budgets allow.) Or a mission might capture ice particles and return them to Earth. As a bonus, spacecraft studying Europa could be solar powered, preserving our supply of Plutonium-238 for other missions. I’m not a mission architect, but the mission concepts described below that have been planned by experts to explore Titan and Enceladus suggest what a highly focused mission might do for an icy world with plumes. And I’ve just learned from a presentation made at the Venus Analysis Group last month meeting that NASA appears to be considering making MMRTG Pu-238 power systems available for the next Discovery mission. That likely would be an enabling decision for the concepts described below for the moons of Saturn where solar power would be an iffy proposition for a tightly cost constrained mission. My original write up of the proposed Discovery-class missions to Enceladus and Titan follows. Over the years of following planetary mission proposals, I’ve come to be especially intrigued by a few of them. Last summer at the Low Cost Planetary Mission conference, new details were presented on two of my favorites, which would explore Titan and Enceladus. Discovery missions are NASA’s smallest planetary missions that in the past have been capped at a cost of around $425-500M for the spacecraft, instruments, and operations (launch costs are counted separately). So far, no Discovery missions have traveled past the asteroid belt (where the Discovery Dawn mission is operating). Fitting a mission to the outer planets into the Discovery budget has proved challenging. To operate far from the sun, these missions usually require plutonium-based power supplies rather than solar panels. NASA has offered to pick up a substantial portion of the costs of adding these power systems to a Discovery spacecraft. However, proposers have commented that there are still substantial ancillary costs to their use that effectively imposes a penalty to missions that require them. In addition, flights to the outer planets take longer to reach their destination, and each year of additional flight costs $7M to $10M from a budget that is already tight. These challenges haven’t kept scientists from proposing exciting outer planet missions (see these posts on a Uranus concept and an Io Concept). The scientific community also has proposed changes to the way NASA structures the Discovery program, including raising the overall cost cap to $500M and adjusting the budget for the length of the time needed to reach a destination. If these proposals are adopted, then Discovery missions to Enceladus and Titan would be easier to do. 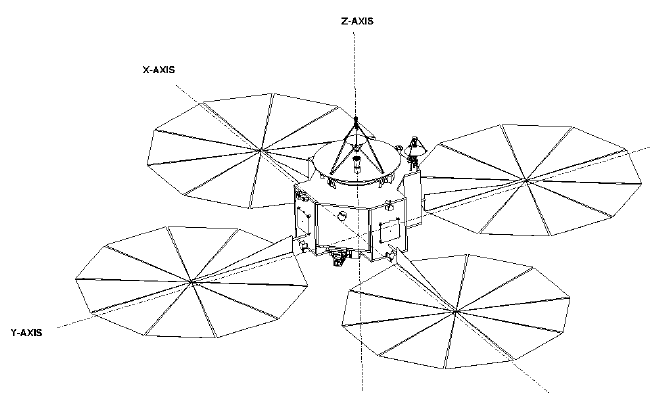 Sample return missions like this proposal were considered by the last Decadal Survey, and two key challenges were identified. The first was to ensure that the Earth could not be contaminated with any life brought back from Enceladus. The Survey report assumed that an expensive sample containment facility would have to be built. The current mission concept proposes to address this problem by tuning “the sample impact velocity such that large molecules would survive, but structures such as bacteria or viruses would not.” However, NASA still could decide that any sample return from a potential life-bearing world requires expensive new facilities. The second challenge for the sample return mission would be that the mission incurs the costs of flying both to the Saturn system and returning from it, resulting in a 15 year flight (4.5 years of that spent returning to Earth). My hope is that the proposers can satisfy NASA on these challenges. As the presentation states, “Determining the presence or absence of life requires multiple analyses that are too complex to fly, and the optimal analytical sequence to follow depends on what you learn at each step of the sequence... Regardless of any biological content of the sample, this would be the first sample from the Outer Solar System and would provide invaluable clues to the origin and evolution of the Solar System.” Or put another way, the ultimate goal for every class of worlds is to return samples back to Earth where the exquisitely sensitive instruments in laboratories can address the most subtle questions. This mission proposes to do this in a way that is simple, low cost, and uses the experience of a team that flew a similar mission. The second mission presented last summer was the Journey to Enceladus and Titan (JET) mission that was the subject of a previous post (that post has considerably more detail on the science goals than this post). JET would build directly on the discoveries of the Cassini orbiter at Saturn. While Titan’s surface is perpetually hidden by haze across most of the spectrum, Cassini discovered infrared windows that allow direct imaging of the surface. Unfortunately the Cassini instrument that can see in those spectra produces low resolution images (~3 km during close flybys). Cassini also has a radar imager, but its best resolution is in the hundreds of meters. The result is that our current maps of the surface of Titan have a mixture of resolutions and colors similar to what we had at the end of the 1960s following the Mariner flyby missions. 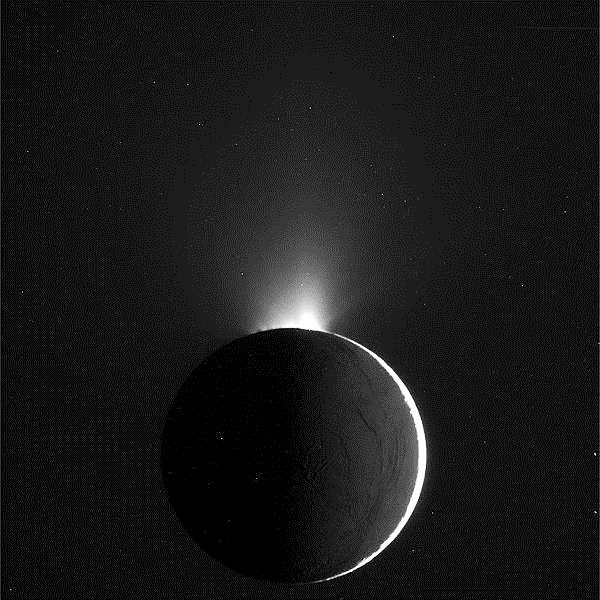 Imaging the sources of Enceladus’ jets also is best done in the infrared where the heat of the material escaping into space makes the vents glow in comparison to the frigid surrounding surface. The JET mission would carry a high resolution thermal imager to map the surface of both moons. At Titan, substantial portions of the moon would be mapped in four thermal bands (“colors”) at resolutions of 25 to 100 m with other areas imaged at coarser resolutions (but still better than Cassini). Coverage would include high priority areas such as the Huygens probe landing sites, the lakes in the northern polar region, and the hilly and mountainous Xanadu region. The resolution images of the sources of Enceladus’ plumes will be higher still since the flyby altitudes will up to ten times closer (although the relative speed will also be higher causing smearing). JET’s second instrument, a duplicate of the Rosetta comet mission’s mass spectrometer, also builds on Cassini’s results. 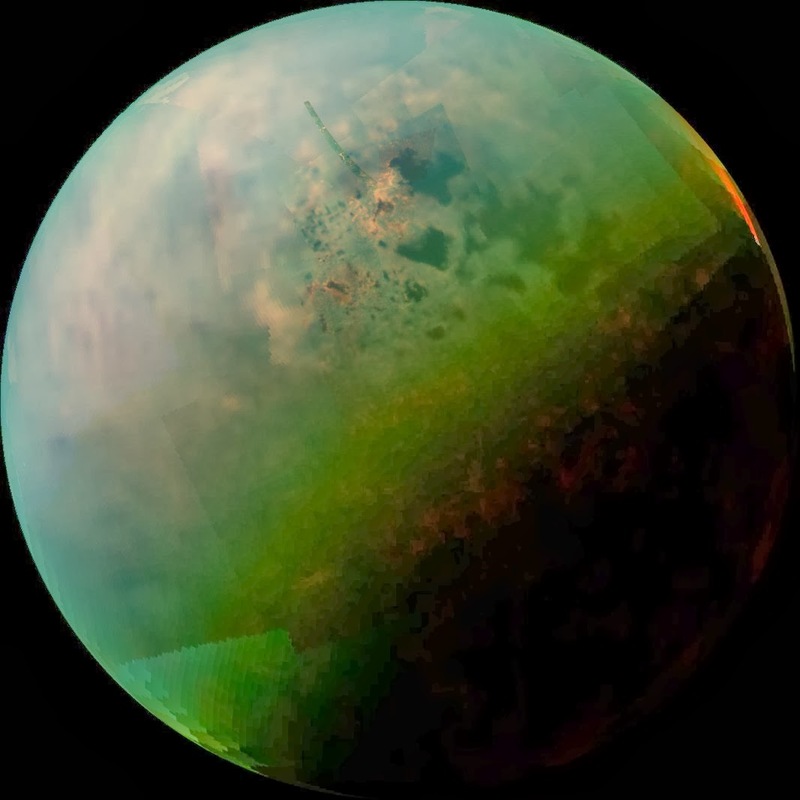 When Cassini was planned, scientists expected that the gasses they could sample at the top of Titan’s atmosphere would be simple as would be the dispersed ice particles between the moons. Now we know that the top-of-atmosphere chemistry is more complex and that Enceladus is spewing gases and ice particles containing complex salts and possibly complex organic compounds into space. JET’s mass spectrometer would be able to measure the composition of material with ten times the atomic mass of Cassini’s instrument, with 100 times better resolution of compounds, and a thousand times the sensitivity. As presented at the conference, the JET proposal hasn’t changed since it was first discussed publicly several years ago. 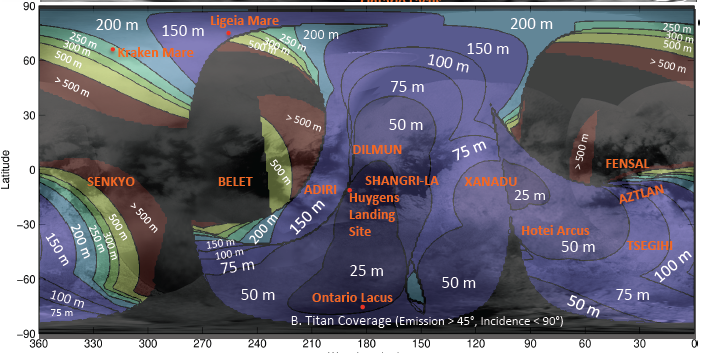 However, new information on the coverage possible at Titan and the design of the spacecraft were included. My understanding is that both these concepts will be proposed for the next Discovery competition (date uncertain, depending on future NASA funding). Like the Uranus Discovery concept I previously wrote about, these are examples of the tightly focused outer planet missions scientists and engineers think could be flown in this program. The keys to fitting under the cost caps are minimal operations during the long flights to their destinations (spacecraft hibernation), small instrument compliments (one each for the Enceladus sample return and Uranus flyby, two for JET), and simple mission operations once at their target worlds. If these measures are sufficient, then we may see the outer solar system opened up to a new class of missions. My thanks to Steve Matousek of JPL for reviewing the description of the Titan and Enceladus mission concepts and providing corrections. The managers of NASA’s planetary exploration are caught between that proverbial rock and a hard place. Given their situation, I admire them for making a tough call to cancel an advanced technology program that could have enabled a new generation of small missions to several exciting destinations in the solar system. The good news is that in the end, the cancellation may make little difference in the missions that actually will fly. That’s the bad news, too. The cancellation was for NASA Advanced Stirling Radioisotope Generator (ASRG) that would have provided a new generation of plutonium-238 (Pu-238) based electrical power systems. ASRG’s could have stretched NASA’s limited supply of plutonium to potentially enable missions to the perpetually-shadowed polar craters on our moon, to flyby Uranus, or to float for months on a Titan lake. NASA has an alternative, flight-proven generator technology, the Multi-Mission Radioisotope Thermal Generators (MMRTGs). Because MMRTGs use approximately four times the Pu-238 as ASRGs for a similar power output, NASA now will need to hoard its Pu-238 supply to power its largest expected missions of the 2020s. That would enable the planned 2020 Mars rover and the hoped for Europa Clipper multi-flyby missions. Supplies for follow-on missions would not be available until late in the 2020s for a small mission and the early 2030s for a larger mission. Comparison of the MMRTG and ASRG power systems. In my post today, I want to give the background for NASA’s decision (that rock and a hard place) and to talk about the types of missions that can still be flown and those that would be lost. The “rock” is NASA’s present tight budget for planetary exploration, which has been cut in each of the last several years. NASA recently learned that bringing ASRGs to flight ready status would cost $100M more than originally expected. By cancelling the ASRG program, NASA saves $170M over the next three years. 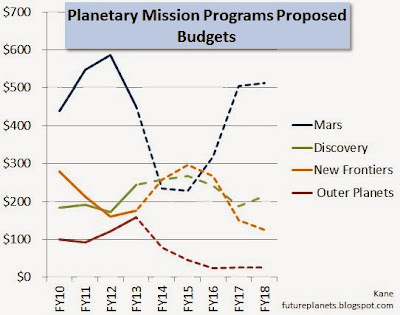 The “hard place” is NASA projected budget for planetary exploration. While Congress appropriates funds for each current year, the President’s Office of Budget and Management provides estimates for future budgets. 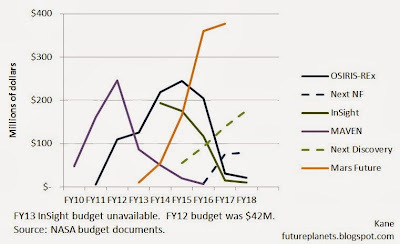 NASA’s managers can only start a new mission when those projected budgets show room in the budget for a new mission. 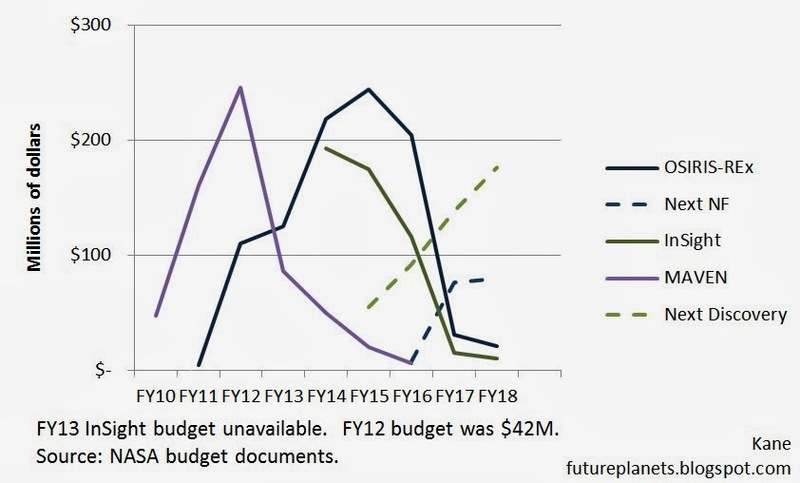 Right now, NASA’s planetary science projected budget shows no room to start a new mission that would launch before the end of the decade and more likely in the early 2020s. 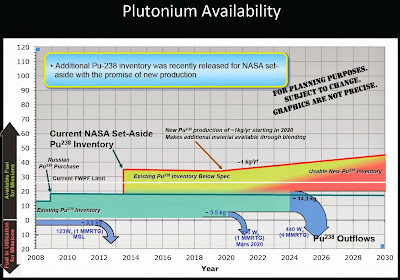 At the rate of mission flights suggested by the projections, there would be little demand for plutonium-powered missions beyond the current Pu-238 supply. Examples of funding peaks for NASA’s current approved smaller planetary missions along with projected funding for the next generation of missions. OSIRIS-REx is a New Frontiers program mission and the Mars MAVEN and InSight missions are Discovery program-class missions. The U.S. has approximately 30 kilograms of Pu-238, or enough for five MMRTG’s. A recently released presentation slide from NASA shows one of those MMRTG’s reserved for the 2020 Mars rover, which will be a close copy of the MMRTG-powered Curiosity rover now on Mars. The other four are held in reserve for a mid-2020’s mission or missions. While not stated in the presentation, this could be the proposed Europa Clipper multi-flyby mission that would require the equivalent of four MMRTG’s electrical power. 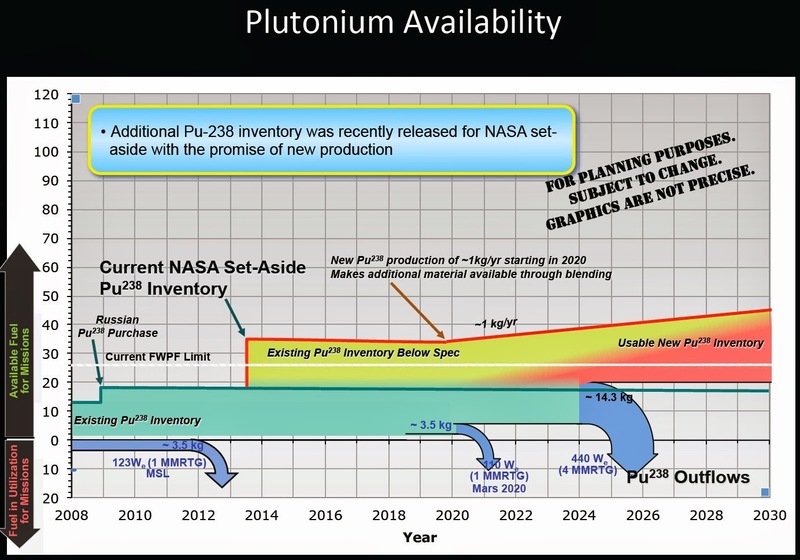 NASA’s expected supply and use of plutonium-238 for the next two decades. Credit NASA (see this presentation). The U.S. has just approved plans to produce new Pu-238 for the first time in decades. The amounts will be small, around one kilogram a year. At that rate, approximately two MMRTG’s could be fueled in a decade with new Pu-238. However, the U.S. has a stockpile of degraded Pu-238 (that presumably consists of material old enough that a significant proportion has become useless because of radioactive decay). NASA plans to mix its new Pu-238 with reworked older material to produce enough useable material to power several MMRTG’s in the 2020s. Given NASA’s new dependence on MMRTG’s, what types of missions can it still fly and which become impossible or unlikely? Answering that question requires understanding when a radioisotope power supply either is absolutely necessary to fly a mission or would substantially enhance it. The alternative is solar power from solar photovoltaic panels. Too far from the sun, and sunlight is too feeble to power a spacecraft. Until a few years ago, that line of demarcation fell somewhere in the asteroid belt. With improvements in low light and low temperature (it’s cold far from the sun) solar cells, solar powered missions at Jupiter are feasible. One (NASA’s Juno) has launched, a second (Europe’s JUICE mission) will launch in 2022, and the proposed Europa Clipper mission could use solar power. Several studies have looked at using solar power for missions to Saturn. The low light, low temperature solar cells should work there. The major problem is that at Saturn, a set of solar panels like those on the Juno spacecraft that produce ~440W at Jupiter would provide only ~110W at Saturn. For the Juno spacecraft, approximately half of its 440 watts of power will go to powering the spacecraft systems and instruments and half will go to running heaters to keep the spacecraft warm. Keeping warm is even a bigger problem at the more distant Saturn, and after running heaters, little electrical power might be available for anything else. More solar panels could be added at the cost of additional weight and fuel to maneuver with that weight. As the appendix at the end of this post states, solar power at Saturn is technically possible, but the trade offs are significant. Beyond Saturn, the size and weight of solar panels would become prohibitive. Realistic spacecraft for Uranus, Neptune, and destinations beyond require radioisotope power supplies (or a future generation of solar panels). Concept design for a solar powered outer planets spacecraft from the Trojan asteroid Decadal Survey mission study. Credit NASA. Other missions requiring Pu-238 missions are those where solar power is intermittent or unavailable. This would include long-term landers or rovers for the perpetually shadowed craters at the poles of the moon or the surface of Titan. Long-lived lunar stations would benefit from radioisotope power since they must survive nights lasting 14 terrestrial days. Mars rovers also benefit from Pu-238 because bright sunlight is available only for part of the day, winter brings dimmed solar light, and dust storms can make noon as dark as twilight. Another challenge for these types of missions (and those in the outer solar system) is keeping the spacecraft warm. Pu-238 power systems have lots of excess heat that can be used without diverting electrical power to heaters. Some inner solar system missions can’t be done with large solar panels. One clever idea was a comet hopper (called CHOPPER) that would land in multiple places on the surface of a comet. Landing repeatedly on a rough surface with large solar panels would be impractical, making a Pu-238 power system an enabling technology. The AVIATR airplane concept at Titan depended on the low mass of the ASRGs to keep it light enough to fly. With only MMRTGs available, that concept is unfeasible. However, hot air balloons for Titan couldn't stay aloft with the lower waste heat available from ASRGs to heat the air for their balloons. This type of mission requires the heat from the additional Pu-238 in an MMRTG. Radioisotope power requirements of NASA's candidate Flagship and New Frontiers planetary missions. From the Decadal Survey mission studies. Based on this table, a reasonable question might be whether the cancellation of the ASRG program will impact the missions that fly. From the list of candidates for Flagship and New Frontiers missions, the answer may be no. There’s sufficient Pu-238 for the 2020 rover and Europa Clipper (which could switch to solar power anyway). Under current budget forecasts, a Uranus orbiter wouldn't launch before the new production of Pu-238 becomes available. All the New Frontiers missions on the list could be done with solar power although this would like incur design challenges for the Saturn probe and lunar network. Where we may see a loss is in the lowest cost class of missions, the Discovery program ($425M to $500M). The expectation had been that NASA would make at least one pair of ASRGs available for a Discovery mission. 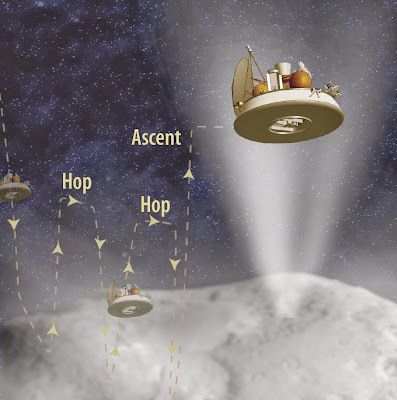 Engineers and scientists came up with clever ideas for ASRG-based missions – the comet hopper, a Titan lake lander, an orbiter to revisit Titan and Enceladus, a Uranus flyby, and others. With MMRTGs now the only option, NASA needs to hoard its supply of Pu-238. It also has lost the motivation to test a new technology – ASRGs – on a relatively low cost mission. MMRTG technology is already proven. So NASA’s managers made the tough call, and if I were in their shoes, I’d have done the same. I do see two glimmers of hope to resurrect those clever Discovery missions though, or to give engineers the flexibility to use MMRTGs for New Frontiers missions. The first is that Congress for the 2013 budget made it clear that it wanted higher funding for future missions. If this desire becomes policy (and the President’s budget office would have to reflect this in their budget projections), then there may be more demand for Pu-238 than NASA is currently envisioning. The second is that if the Europa Clipper design team decides to go with solar power instead of MMRTGs, NASA will have more Pu-238 than missions planned to use it. In this case, they might make MMRTGs available for New Frontiers or even Discovery missions. You can help build the political support to increase funding for NASA's planetary science program by participating in the Planetary Society's letter writing campaign. As part of the 2012 Decadal Survey to create a roadmap for NASA’s planetary missions, studies of a number of potential missions were conducted. Two looked at smaller spacecraft to carry and atmospheric probe to Saturn and relay its data back to Earth and to conduct multiple flybys of Enceladus. Both studies concluded that solar cells were possible, but radioisotope power systems were preferable. The following excerpt from the Saturn probe mission study report discusses the challenges of solar power at Saturn. “Regarding power systems, although it might be possible to use solar arrays for the carrier-relay spacecraft’s primary electric power system, operating at 10 AU would push the very limit of current solar cell technology, requiring large margins and an expensive parts selection program for the solar cells. For the mission time period studied, a radioisotope power source (RPS) is less expensive and lower risk for this mission than a solar array system, and would perform well in all mission phases.